Child Development: A Cultural Approach helps students learn how to think culturally about human development throughout our diverse, increasingly globalized world. Authors Jeffrey Arnett and Ashley Maynard weave an engaging chronological narrative that traces development from birth through emerging adulthood, integrating current research and cross-cultural examples from around the globe throughout. The Second Edition offers substantially updated content, as well as new coverage of key educational issues, to help students achieve a thorough, practical understanding of development throughout the world. 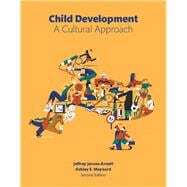 Child Development: A Cultural Approach, Second Edition is also available via REVEL™, an interactive learning environment that enables students to read, practice, and study in one continuous experience. Jeffrey Jensen Arnett is a Research Professor in the Department of Psychology at Clark University in Worcester, Massachusetts. He received his Ph.D. in developmental psychology in 1986 from the University of Virginia, and did three years of postdoctoral work at the University of Chicago. From 1992 to 1998, he was Associate Professor in the Department of Human Development and Family Studies at the University of Missouri, where he taught a 300-student life-span development course every semester. In the fall of 2005, he was a Fulbright Scholar at the University of Copenhagen in Denmark. His primary scholarly interest for the past 20 years has been in emerging adulthood. He coined the term, and he has conducted research on emerging adults concerning a wide variety of topics, involving several different ethnic groups in American society. He is the Founding President and Executive Director of the Society for the Study of Emerging Adulthood (SSEA; www.ssea.org). From 2005 to 2014 he was the editor of the Journal of Adolescent Research (JAR), and currently he is on the Editorial Board of JAR and five other journals. He has published many theoretical and research papers on emerging adulthood in peer-reviewed journals, as well as the books Human Development: A Cultural Approach (2016), Adolescence and Emerging Adulthood: A Cultural Approach (2015), and Emerging Adulthood: The Winding Road from the Late Teens Through the Twenties (2015). Ashley E. Maynard is Professor and Chair of the Department of Psychology at the University of Hawai’i at M noa, where she has been on the faculty since 2001. She received her Ph.D. in Psychology in 1999 from the University of California, Los Angeles (UCLA) and did two years of postdoctoral study in Anthropology and Cultural Psychology in the Department of Neuropsychiatry and Biobehavioral Sciences at UCLA. Ashley has taught approximately 4,000 students in courses ranging from Introductory Psychology to Lifespan Development at the graduate level. Her primary research interest since 1995 has been the impact of cultural change at the macro level, such as economic and sociodemographic shifts, on socialization and cognition in childhood. She also studies the development of teaching in childhood and sibling interactions. She has worked with her students on research in Mexico, Costa Rica, and Hawai’i. She has won national awards for her research, including the James McKeen Cattell Award from the New York Academy of Sciences and the APA Division 7 (Developmental Psychology) Dissertation Award. She has published many articles on culture and human development in peer-reviewed journals, and in a volume she edited with Mary Martini, Learning in Cultural Context: Family, Peers, and School (2005). She lives, teaches, and writes in Honolulu, Hawai’i. For more information on Dr. Maynard and her research, please see www.ashleymaynard.com.